The Build Zimbabwe Alliance appreciates NewsDay’s recognition given to our party’s manifesto and the practical comparisons made between the five manifestos that were reviewed. Our proposals are based on the assumption that BZA will have a clear mandate to govern and set in motion measures that will restore local and global investor confidence, thereby making Zimbabwe a safe and preferred destination for investment. In the case of insufficient parliamentary representation, then Build Zimbabwe Alliance will seek the support of other parties to enhance the Constitution. BZA Response: In the event of insufficient parliamentary representation, then Build Zimbabwe Alliance will seek the support of other parties to suitably enhance the Constitution. BZA Response: In Chapter 4:72 of the Constitution, the wording is open-ended and racially skewed. We should no longer perpetuate this after 38 years of independence. It is time to unleash the full potential of all our peoples in re-establishing this nation as the breadbasket of Africa. As far as land redistribution is concerned, there is consensus across party lines that landless Zimbabweans needed resettlement, but also that compensation should be paid to those who were dispossessed. BZA will undertake a comprehensive audit to ensure that the land was correctly allocated to those who qualified and were deserving under the scheme. Those found not utilizing commercial land should relinquish it to the state, so it is made available to competent farmers regardless of race. Also, the Constitutional issue of “Title” should be resolved, for the Land to become a bankable asset. 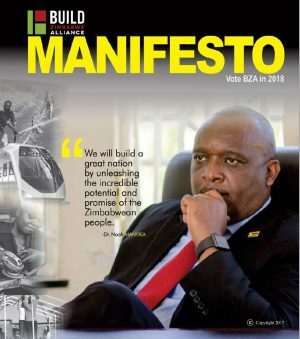 BZA Response: Zimbabweans worldwide have amazing leadership skills which, if fully mobilized in government, could transform Zimbabwe into a thriving 100 billion Dollar economy by 2028. NewsDay, unfortunately, misinterpreted the manifesto in the article. BZA does not intend preventing MP’s from being Ministers, but the Constitution is to be amended to allow the pool to be broadened so that the best candidates possible can be chosen as Ministers, whether inside or outside parliament. BZA Response: The bloated Governments of recent years have cost the nation in high overheads and budgetary deficits. We are a relatively small economy that needs to be managed efficiently and without areas of duplication. In this objective the second Vice-President is considered superfluous and, similarly, Government Ministries will be reduced to 15. Implicit in the 2013 Constitution, is the requirement that elections should be held “Efficiently, freely, fairly and transparently.” This conflicts with the provision that the President selects the Chairperson of the Zimbabwe Electoral Commission (ZEC) which allows for the possibility of overt political influence in the process. The BZA policy is therefore to create a fully independent Electoral Commission that will uphold the right of every Zimbabwean to vote, whether resident inside or outside Zimbabwe. Similarly the appointment of the Registrar General will be transparently appointed from a pool of non-partisan professionals. Copyright © The Build Zimbabwe Alliance. All Rights Reserved.